The land of Shima is in environmental crisis because of all things blood lotus. The Shōgun of Shima wants to be a Stormdancer for which he needs a thunder tiger. To everyone’s shock, his Master Hunter, Masaru, finds the arashitora but is separated from it and his daughter, Yukiko, when the sky-ship is too damaged to fly and catches on fire. Yukiko and Buruu find themselves in the forest of the Iishi mountains where they encounter oni, partner with Kin the Artificer, and come across Kagé. Daichi, an ex-samurai who killed her mother on the Shōgun’s command, asks Yukiko to kill him. Yukiko spares his life and agrees. Her plan is working well back on Shima when Yoritomo cuts of Buruu’s wings and Yukiko asks Kin to make mechanical ones. However, Hiro, working under the order of the Shōgun, betrays her. On bicentennial, Yoritomo kills Aisha and Kasumi dies at the hand of tthe bushimen. Michi and Akihito get away. Yukiko manages to kill Yoritomo with the help her father who’s actually the one with the kami spirits but dies as a result. In a forest somewhere Yukiko wished that she had listened to her father as she fights a losing battle with a pair of oni when a beast saves the day as well as Yukiko’s life. Two weeks before that incident, Shōgun Yoritomo wakes up in his palace after dreaming of riding a griffin and now wants one. Yukiko arrives at the gambling den in time to stop the fight among Masaru, her father, Akihito and the dealer and his men. She has received word that the Shōgun has summoned his master hunter, Masaru, to hunt for a thunder tiger (a creature that no one believes actually exists). Travelling on foot through the Kigen City to Docktown, Yukiko, Akihito and a passed out Masaru encounter a girl being led by the Purifiers to be executed on the Burning Stones for being impure which means she possesses the kami spirits. The trio arrives in Doctown where Kasumi informs them that they are to wait for the arrival of Shōgun before leaving on their hunt for an arashitora. Yukiko gives Kasumi the cold shoulder because her father and Kasumi are in looove. The procession carrying the Shōgun of Shima and his sister, Lady Tora Aisha, arrives in Docktown where a really awkward (and dangerous) thing happens involving a puppy, a samurai with the sea-green eyes and the Shōgun himself. Dangerous because Yukiko almost exposed herself. In a flashback to Yukiko’s childhood, she and her twin are unusually attached to their scenthound, Buruu, because the kami spirits of the Iishi mountains gave them the ability to feel what the animals feel and read their thoughts. Yukiko used to have a twin brother, Satoru and her mother apparently left. Yukiko meets Kin on the deck in the middle of the night. I like him. Her relationship with her father worsens when she find him smoking weed with a couple of guildsmen. Then he tells a tale about Boukyaku, the Dragon of Forgetting and his slayer, Kitsune no Akira who was one of the great Stormdancers to ever exist. (Hey, I want to slay a sea dragon). Kasumi tries to talk some sense into Yukiko by reminding her that her father loves her but it’s no use. And oh, they also spar and Yukiko wins. My home girl. Fun fact, no one on the Thunder Child wants to risk their life by hunting for a mythical creature and even more so during a toxic thunderstorm but it’s futile either way. In another flashback, a hungry wolf bites Buruu, the combined rage of Yukiko and Satoru kills the wolf while blood flowed from their noses and they say a reluctant goodbye to Buruu. The Thunder Child slowly makes it way to the Iishi Mountains where someone finally spots the oh-so-magnificent arashitora who breaks off a part of the hull when Masaru tries capturing it by putting it to sleep via blacksleep. Fire ignites, lives are lost but the four doses of blacksleep does nothing to stop the griffin. Yukiko reaches out to the griffin and they’re just introducing themselves when the blacksleep kicks in. The griffin is caught in a net and hauled into a cage on the sky-ship and Yukiko is filled with sorrow at the sight of men celebrating their victory. The Child is in a pretty bad shape. Then the arashitora starts to beat its wings producing the sound of the Raijin song which shakes the airship so badly that Masaru decides to tame it by clipping its wings. Yukiko tries to stop him but it’s of no use. They’re arguing when the Child catches fire. Everything is in utter chaos. Masaru and Yukiko manage to get on the life raft just in time but when Yukiko sees and feel the anguish of the thunder tiger, she jumps out of the life raft to rescue it. Yukiko gets on his shoulders and they manage to get away before the sky-ship blows into pieces but the thunder tiger wants her to get off of him. She gets thrown off the griffin when she’s hit by a thick branch. Separated from the beast, she encounters a pair of oni in the forest and has lost the fight when the thunder tiger comes to save her to pay his debt to her (y’know the scene where the book started). In a yet another flashback, Shōgun Kaneda has died and the new Shōgun made Masaru the Master Hunter and commanded that he moves to Kigen, a command which repulsed Naomi to no end. In the following days, a serpent strikes Satoru and he dies in her arms as Yukiko reaches into his mind to comfort him. In the forest, Yukiko wakes up to find the thunder tiger leaving and convinces him that they should stay together as she’d give him tribute and he the protection she needs. She decides to call him Buruu. They have another encounter with a trio of oni and Buruu slays them with ease and magnificence. Yukiko and Buruu come across an Artificer and finds out that he’s actually Kin. Kin is forbidden to touch anything that has remote traces of blood lotus, his atmos-suit feeds him nutrition intravenously and he basically thinks of it as his skin than his actual skin. Weird, right? Buruu is jealous of Kin because he wants Yukiko to talk to him and not Kin. It’s ridiculously adorable. As days pass, Kin becomes suspicious of what Yukiko is. Uh oh. Kin falls in a deep hole which is basically a human-made trap and his atmos-suit almost burns him alive when it malfunctions. Kin tells Yukiko that the beacon in his atmos-suit would’ve informed the guildsmen of its destruction and they’d come looking for him. Yukiko hides his atmos-suit near the trap. Yukiko and Buruu decide to hunt the trap setters and come across two humans, Isao and Kaiji, who look like they’re warriors. Yukiko informs them of their situation and they offer them shelter in their village nearby. Yukiko is hesitant but agrees because endless rain and an injured Kin. In the village that stretches out through the boughs, they meet Kaori who’s so beautiful that Yukiko gasps at her beauty despite the diagonal scar running from her forehead to chin. She takes him to her father Daichi who Yukiko thinks she knows. Daichi is a ronin because Shōgun Yoritomo wanted Kaori and Daichi refused which is why he was demoted and her daughter’s face scarred for life. The next day, Eiko comes to visit Yukiko and tells her about the unfairness that breeds in the land of Shima, how her family was forced out of their lands by clan Daimyo. Isao and Atsushi peek on Yukiko taking a bath when they see her tattoo of the imperial sun. Trouble alert. In the palace of Shima, Masaru and Yamagata arrive and inform the Shōgun of the news of their sky-ship crash and the subsequent death of Yukiko and the arashitora. The Shōgun first kills the Child’s captain and orders Masaru to be imprisoned. ‘Tis a bad day to be Master Hunter. Masaru had told Akhito and Kasumi to flee before coming to the palace with the dreaded news. Isao confronts Yukiko along with Kaori and other men dragging a very confused Kin with them. Kaori is sure they’re the Shōgun spies and a threat to Kagé. Kagé are the source of disturbance in Shima, setting fields and refineries on fire all around in an attempt to bring an end to the destruction brought upon them by the blood lotus. Daichi arrives and believes Yukiko but he thinks Kin should not be forgiven as he is a guildsman. However, they’re interrupted with the news that the oni have arrived to avenge the death of their brethren and so a battle begins. The arashitora asks Yukiko to get on his shoulders and together they slay the red warlord and the rest of the oni flee. 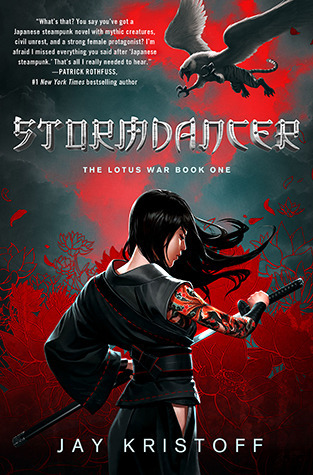 Yukiko is the Stormdancer, yōkai-kin. Daichi asks Yukiko to promise to kill Yoritomo who commanded Daichi to kill her pregnant mother as a warning to Masaru. Yukiko is at the throat of Daichi when she realizes that Yoritomo is the hand behind it and killing Daichi won’t yield anything. She promises to kill the Shōgun. Yukiko is rescued by the Guildsmen, who arrived looking for the Artificer, along with Buruu and Kin after setting up herself in a way that suggested they were lost in the forest. Yoritomo greets Yukiko and is overjoyed at the sight of the arashitora. He intends to take Buruu to the arena and agrees to take Yukiko with him at her request. In the arena, Buruu is chained to the earth and Yoritomo tells Yukiko he knows that she’s yōkai-kin and intends to use her as a messenger between the beast’s mind and his. Yukiko asks to see her father and the iron samurai, Lord Tora Hiro, is given the order to accompany her at all times during her stay in the palace. Hiro is the samurai with the sea green eyes. They talk, he remembers her (!) and doesn’t think that the Guildsmen are priests. Buruu doesn’t understand the coupling of humans, it’s hilarious. In Kigen’s Chapterhouse, Kin again dreams of the vision he saw. Shateigashira is to punish him and he firsts ask him to tell everything Kin knows about Yukiko. In the prison, Yukiko meets his father who tells him how calmly Yoritomo took her mother’s life and threatened to take everything else if Masaru dared defy him ever again. Yukiko promises to get him out. Shateigashira arrives in Yoritomo’s court to inform him about the impure Kitsune girl. Yoritomo demands proof which has never been needed before. Yukiko has tea with Lady Aisha who informs her that she’s working with Kaori (by only showing her a wisteria bloom, mind you) to bring down the Shōgunate and that Yoritomo laughed in the face of the Guild’s emissary who came to have Yukiko’s execution commissioned. Hiro is green with heartsickness or so Michii, Lady Aisha’s maidservant, thinks. In another tea session with Lady Aisha, she informs Yukiko that Akihito is safe in Docktown while she Kasumi smuggled inside the palace. Yukiko meets Kasumi. There are actual tears. Yukiko demands that his father be freed and on his way to Yama with Akihito and Kasumi before Yukiko risks her life for Lady Aisha. It is pretty impressive. She’s my homegirl, after all. Seiji the Keeper of Tigers comes to know that the arashitora has begun moulting. This is bad. Hiro carries Yukiko to her suite and they kiss. In the morning, Yukiko looks at the mechanical arashitora Kin had made for her and an idea forms in her mind. Kin is not-so-hard at work on Yoritomo’s saddle on alternate shifts when he spots Yukiko’s note about wanting to talk. Someone visits Masaru in his prison with a package and tells him to be ready for freedom. Lady Aisha visits a very sullen Yoritomo and makes him promise to give the Yukiko to her and wait for the surprise that will cripple the Guild. Kin visits the arashitora in the arena and finds Yukiko there. Clearly in love with Yukiko, he tells her that he can do make the arashitora’s wings in a week and that he’ll be leaving with her. Hiro had been taken off Yukiko’s guard duty and as she spends the days planning her escape with Michi close to the bicentennial. Hiro comes to visit Yukiko. She sees that he’s absolutely loyal to Yoritomo-no-miya and knows that he cannot be included in her plan. Hideo, Yoritomo’s minister, is Hiro’s uncle and asks him to hear his lament to which the Shōgun begrudgingly agrees. And oh, Hideo is suspicious of the increased activity around the arashitora but Yoritomo tells him not to worry about it. Kin tells Yukiko that everything will be ready in two days time on the eve of the bicentennial. She asks why he’s doing it, trying to will his answer to not be what she knows it to be. Kin tells her that they will talk all they want once they are in the air and leaves. Yukiko feels like a fraud knowing Kin loves her. Hiro comes looking for her and she sees that it was a mistake to be with him and silences him with a kiss when he’s about to proclaim his love. Kin sees it all and feels like an utter fool. Michi, Akihito, and Kasumi make their way to the prison to free Masaru while, in the arena Yukiko injects the bushimen with blacksleep and prays that Kin arrives soon as the storm grows close. As the trio moves along corridors, Kin arrives in the arena with the gear. Yukiko comes to know that he knows about Hiro. Hiro who was only working under Yoritomo’s order to spy on Yukiko. Yoritomo arrives in the arena having just killed Aisha and when he sees the thunder tiger and the Stormdancer as one, slaying Hiro, he runs. Buruu is yet to be fully free of the chains so Yukiko runs after Yoritomo but is too far away to actually kill him when her father helps her. Masaru is actually the one with the kami spirits. He Kenned the rats in the prison, telling them to eat the bushimen and Hideo alive when he saw Kasumi being killed. Kin arrives on Buruu and Yukiko flees Kigen city with Masaru who speaks his last words to Yukiko through Buruu’s mind and breathes his last. As the truth about inochi is revealed, unrest ignites in Shima but everything is put on hold for the mourning. After the forty-nine days of mourning are over, Yukiko arrives on the shoulders of Buruu to demand from the people of Shima to decide where they stand. To rebel. Arashitora – A thunder tiger also known as a griffin. Artificers – Engineers and technicians of the Guild. Blacklung – A type of lung cancer due to inhalation of chi exhaust. Blacksleep – A potent toxin derived from the roots of blood lotus. Brass Atmos Suit – A suit for protection from pollution. Chi – A primary fuel extracted from the seed of the blood lotus. It’s also the base for the environmental destruction in the land of Shima. Cloudwalkers – Men who fly airships. Code of Bushido – A code of conduct followed by samurai nobility and common-born warriors throughout their lives. Daimyo – Leader of the clans and powerful military Lords. Inochi – A fertilizer applied to the blood lotus fields to delay soil degradation made from the liquefaction of the gaijin prisoners of war. Kenning – The act of reaching into another living thing’s mind to know their thoughts and feelings especially animals. Lady Izanami – Dark Mother, wife of Lord Izanagi, who birthed the Shima Isles and the oni of Yomi. Lord Izanagi – Maker god. Lotus Guild – Controller of all the production of blood lotus in Shima as well as in eliminating the kami spirits. Oni – Demon spawn of the Yomi underworld. Purifiers – Guildsmen who light the pyres under those childrens’ feet who possess the elemental kami spirits. Ronin – An ex-samurai. A noble-born warrior without a Lord. Shōgun – A hereditary governor. Thunder Child – Airship on which the quartet hunted for the thunder tiger. Yomi – Deepest level of hell where Lady Izanami and her oni reside.